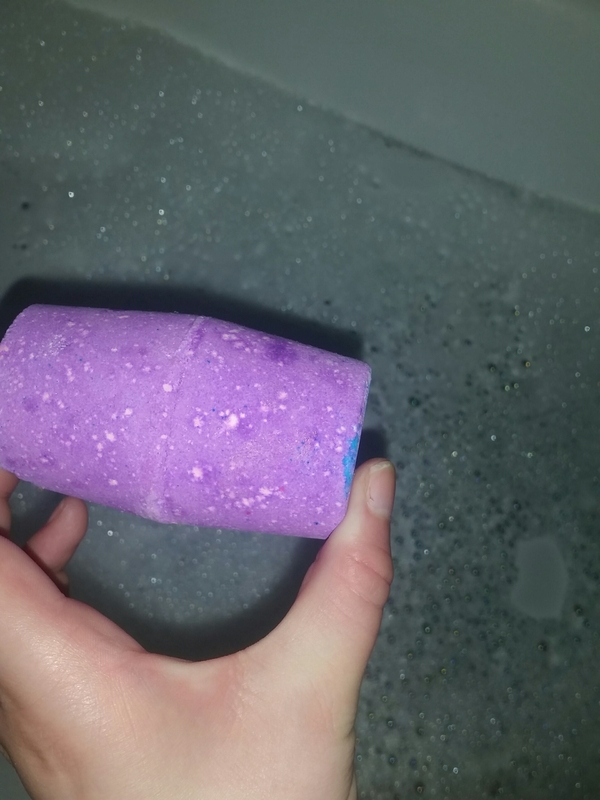 As far as bath bombs go Northern Lights by Lush Cosmetics looks simple but very pretty when in its whole and dry form with a purple coating and hints of yellow and blue at alternate ends. It is this one colour at one end with a different one at the other that causes me the most problems because it means cutting it in half and getting the same result is pretty much impossible; instead the whole thing must be plummeted into the water. With the ones I got in the boxing day sales I did not feel quite so bad doing this but it still meant putting £1.65 into a bath I would only sit in for an hour. You are probably thinking the enjoyment outweighs the cost of the product but remember this is a frugal Yorkshire lass speaking and I cannot help but be reminded £1.65 is pretty much what dinner costs in total for my partner and I a night. I could certainly never justify £3.30 on it full price without cutting it in half and losing some of its magic. But what is this magic I speak of? Well it attempts to turn the bath into a scene you would find in the Scandanavian region, perhaps Northern Scotland, called the Northern Lights where the sky flickers and glimmers around to product a whole selection of stunning colours. The sky is a blue and green shade but the incredible waves of light and colour make it unique each night and the whole area is lit up much like somebody has put a serene disco light set into the sky. The shape of the product is made to set it spinning and into a spiral to create a magical pattern on the surface of the water but that is only possible if both colours are properly in the water; making cutting it lengthways the only option and even then I would be skeptical about its rotating ability afterwards. Whilst all the colours combine underneath to create a dark green that would often be seen up in the sky during a Northern Lights display. The colours on the top were absolutely stunning and helped to cover the dark green that I was not so keen on beneath the bubbles but it certainly took a fair while for it to get anywhere near looking like the above picture; take a look on my instagram for a video that displays just how slow the process was given I kept pausing the video before carrying it on. Whilst it taking a while to disappear was enjoyable to some degrees I felt it was just a touch too slow and that the process being hastened just slightly would make the colour development much more exciting. With the ballistic containing citric acid, jasmine absolute, ylang ylang oil, limonene and perfume the scent of the unused product was very floral and in honesty made me feel old person with some scented talc powder; there is no way of getting around it but smelling this in a shop you would think musky. But when it hits the water the scent seems to fade quickly and there is just a hint of floral which as it seems more gentle also feels a lot less ‘old person’; it was still pretty hard to relax with as I am slowly realising floral scents, other than perhaps in a perfume, are not really my thing. I wish the speed of the colours releasing was quicker and the scent had something to counteract the floral musky tones. It did seem to leave my body feeling a little softer than usual, thanks to that created dark green shade. If it comes back for another Christmas, after introduction and development over the last few years, it probably will not be one I gravitate towards. If you have ever used Northern Lights I would love to know your opinion. Either share your thoughts or blog post in the comments below or tweet me a few words summing the product up for you. This entry was posted in Bath/Shower, Beauty, Lifestyle and tagged bath, bath bomb, bblog, bblogger, bbloggers, Beauty, beauty blog, beauty blogger, beauty bloggers, blue, bright, bubbles, christmas, christmas collection, color, colour, floral, fresh, lblog, lblogger, lbloggers, life, Lifestyle, lifestyle blog, lifestyle blogger, lifestyle bloggers, lush, lush cosmetics, northern lights, pattern, purple, relaxing, scent, scented, vibrant, yellow. Bookmark the permalink.